We know our climate is changing. The science is clear and conclusive. Climate change is real and is accelerating at an alarming rate. It is a serious threat to the well-being of Manitoba’s economy, ecosystems, and communities. But there is hope. In March of this year, a public consultation was held encouraging Manitobans to tell us what their vision is for a cleaner, greener Manitoba. The result is the Made-in Manitoba Climate and Green Plan -- a bold new vision that builds upon our early, strategic investments in clean hydroelectricity. Manitoba is proposing this climate and green plan framework for more of your consideration and input. This is your opportunity to help shape the prosperous, green Manitoba of the future. Our vision is to make Manitoba Canada's cleanest, greenest, and most climate resilient province. It is a vision based on the strong foundations already put in place by Manitobans. It is a vision we can achieve with this strategic framework we are proposing to Manitobans. 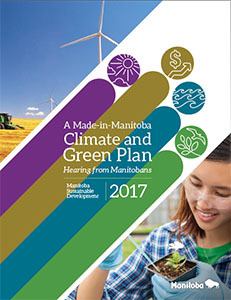 Read the Made-in-Manitoba Climate and Green Plan (pdf 12.3 MB).